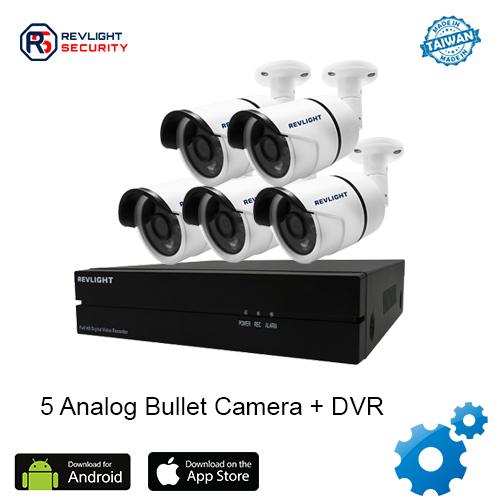 Our 5 Camera DVR Security System Consists of 5 analog camera including one 8 channel dvr system with 3 TB video recording storage, which has 1 year warranty. Automate And Save Money With A 5 Camera DVR Security System. Simplifying and automating processes in your business are a great way to add hours to your week. 5 Camera DVR Security System is one way you can save time and money. With 1080 lines of resolution, a clear picture is what you’ll experience from our small analog cameras. Weatherproof housing and a simple to install bracket for either ceiling or wall mounting keeps installation quick. Experience the best HD CCTV Security cameras available. 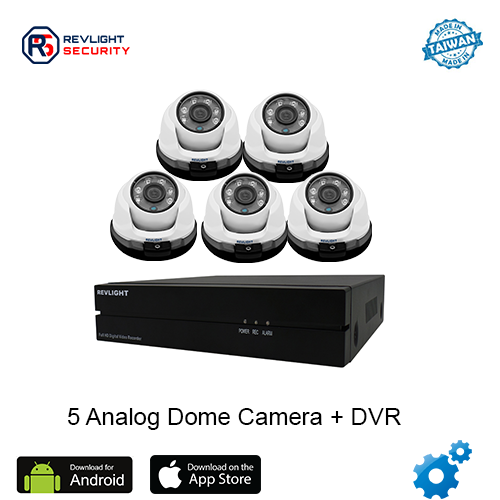 Revlight Security’s HD CCTV Security Camera Systems Give You The Highest Quality Video. All of our security systems work hand-in-hand with our Digital Video Recorders (DVR). If set up together you are then able to not only record and review your camera feed, but also with the use of a DVR Viewer App, you can watch anytime from anywhere. Our DVRs come compatible with standard power/video BC (round) connectors making installation a breeze. Simple to set-up, simple to use. With the best security cameras available, making a choice should be easy. Still have questions? Not sure if we have what you are looking for? Call our Revlight Security CCTV Team experts today for a free consultation at +65 6678-6557. We used Revlight Security CCTV Camera to install live streaming cameras in our apartment. Chris and team were amazingly helpful. We are not the most computer savvy people, and they walked us through how to set up the cameras so we can watch from our iphone. They are truly awesome!! Thank you Revlight Security Team …….